The Rocks are over-spending to try to stay in the National League South – but insist they will not get into debt. Manager Jack Pearce insists it’s not finances preventing them bringing in the sort of striker who could transform their fortunes. He says they are already spending more than they planned to this season but the extra money is coming from their cash reserves rather than loans. They’ve been hit by a rash of long-term injuries which has forced up the amount having to be spent weekly on players – and by suspensions, with Calvin Davies’ red card in the 1-0 defeat at Chippenham their fourth sending-off in seven games. But Pearce said if they could lure a quality forward to Nyewood Lane who they felt could boost their hopes of avoiding the drop back to the Isthmian League, they would find the money to do it. Saturday’s defeat in Wiltshire left them nine points adrift of safety with 13 games left but many fans seem ressigned to relegation. Bognor missed the chance to kick-start a possible revival when Tuesday’s home clash with Welling was rained off. They will try again on Saturday when play-off-chasing Braintree visit the Lane. Pearce said: “We trained on Tuesday night and the atmosphere was excellent. You wouldn’t think it was a team who were second from bottom who were training. “I’m not stupid. I realise it’s a major task and we still have a major problem in that we don’t have a goalscorer and don’t look like scoring. “We’re not working goalkeepers rnough. We don’t pull the trigger when we have a chance. “The balance of the team isn’t right. I can’t blame the players for not giving the effort. “I’m more aware than anyone that the balance isn’t right but the answer, in terms of who can solve that, is not staring us in the face. “There are good forwards around whose clubs would be happy to allow us to have but who don’t want to come to Bognor. “We are willing to gamble financially. We will pay a bit over the odds if we can get that key player in. “We are losing money as a business because of how this season has panned out. We are over-budget to try to stay in this league – we want to stay up. Pearce will be without Davies – who is banned for four games because his Chippenham red card was his second of the campaign – and Icelandic striker Stefan Ljubicic, who has another two matches of a three-game ban to serve after a red card versus Truro. 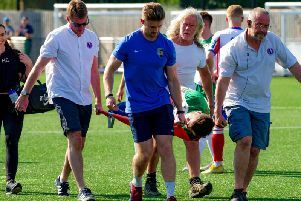 Long-term injury victims James Crane, Corey Heath and Chad Field have been joined in the treatment room by Dan Beck, who came off at Chippenham with a groin problem and is likely to be out for two weeks. But midfielder Doug Tuck and centre-half Sami El-Abd are over their recent niggles and striker Ollie Pearce is working his way back to full fitness after a long-term groin problem, having come off the bench at Chippenham. Pearce said Braintree would present another stern test for the Rocks. “As I’ve said many times, this is a very competitive league and there’s not a lot between the clubs chasing the play-offs and those near the other end of the table,” he said.